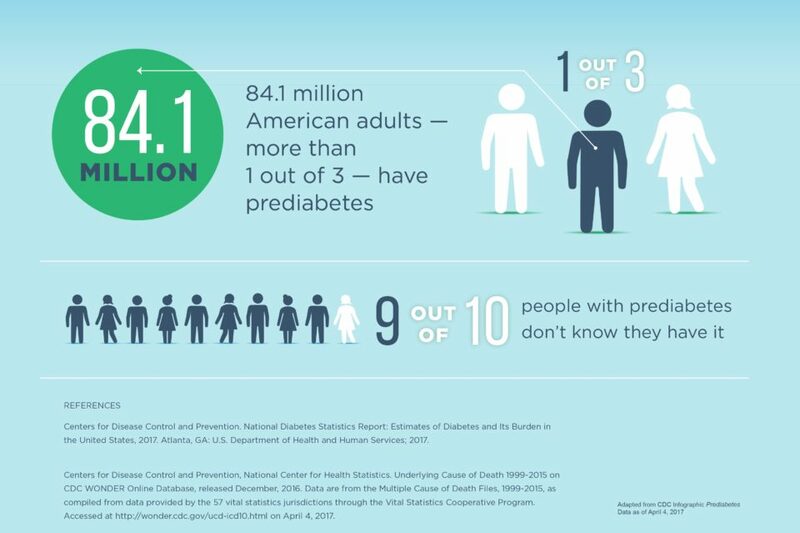 Summary: More than 1 in 3 American adults has prediabetes, and 90% of them don’t know it. The disease remains largely undetected. Because people aren’t getting treatment, the condition kills 50% more people than its big sister, diabetes. This article provides a free online tool to assess your risk. Prediabetes treatment helps to prevent type 2 diabetes and adds years to your life. 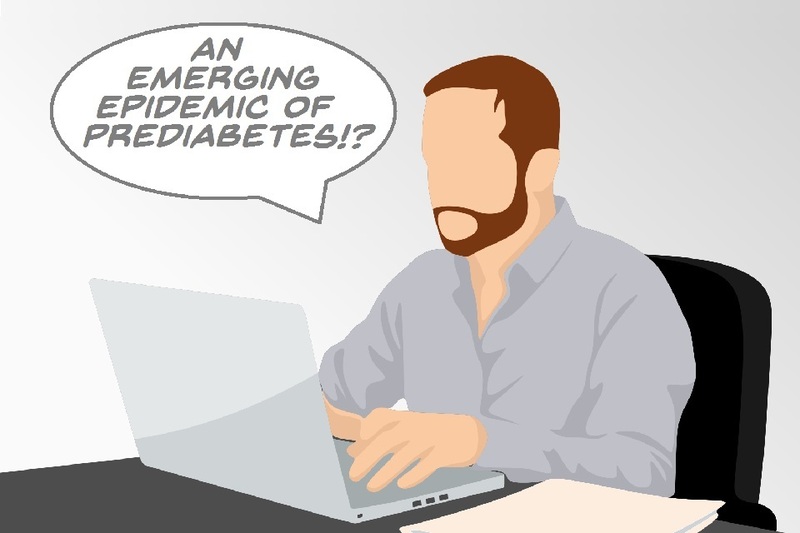 Most of us are aware that diabetes is a major public health concern. What these same people don’t realize is that prediabetes, also called borderline diabetes, is far more prevalent. 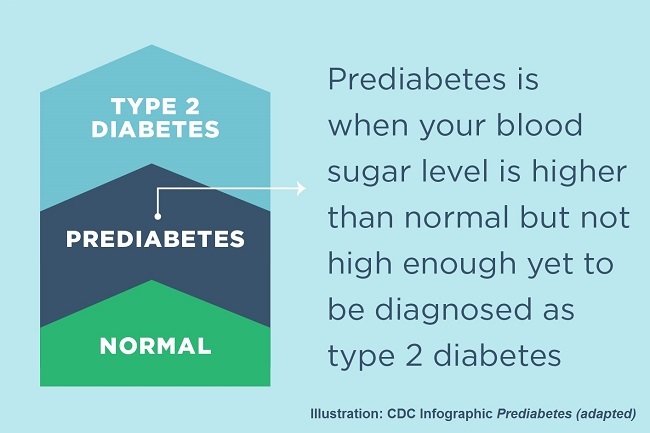 Prediabetes typically precedes full-blown type 2 diabetes. Because most people don’t know they have the condition, they aren’t getting proper prediabetes treatment and are missing an opportunity to prevent full-blown type 2 diabetes. Because the disease is largely undetected and untreated, the World Health Organization (WHO) estimates that prediabetes is responsible for 50% more deaths than type 2 diabetes itself. The earlier the disease is diagnosed, the sooner prediabetes treatment can begin and prevent the progression to full-blown diabetes. One in three adults has prediabetes. Because 90% of them are unaware they have the disease, they are missing out on treatment. Prediabetes increases the risk of full-blown diabetes. Treatment helps to prevent type 2 diabetes and adds years to a prediabetic’s life. If you are at high-risk, get screened for prediabetes. CDC Prediabetes Treatment and Detection Statistics. Illustration adapted from CDC Infographic Prediabetes. Here’s an astonishing statistic: one in three adults has prediabetes, according to the latest report from the U.S. Centers for Disease Control and Prevention (CDC). Amazingly, 90% of them don’t know they have the disease. People with undiagnosed and untreated prediabetes, are at increased risk of heart attack, stroke, and early death. Risks they could avoid by early detection and proper treatment. Prediabetes treatment options include lifestyle changes and inexpensive tablets. Proactive prediabetes treatment can add years to your life and prevent the onset of deadly diabetes. Before getting full-blown diabetes, many people develop prediabetes, a condition in which blood-sugar levels are higher than normal, but not high enough to be considered diabetes. Without treatment, prediabetics are at much greater risk of developing full-blown diabetes. The largest risk factors for prediabetes are age and being overweight/obese. The risk of prediabetes increases with age. As well, the higher your body mass index (BMI), the greater your risk. 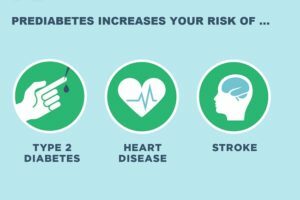 According to the CDC, the following factors increase a person’s risk for developing prediabetes and type 2 diabetes. Being 45 years of age or older. Being treated for high blood pressure. African Americans, Hispanic/Latino Americans, American Indians, Pacific Islanders, and some Asian Americans have a higher risk. Having a parent or sibling who has type 2 diabetes. Being physically active fewer than three times per week. Having ever had diabetes while pregnant (called gestational diabetes). Having ever given birth to a baby that weighed more than 9 pounds. Are you one of the 33% of Americans with prediabetes? 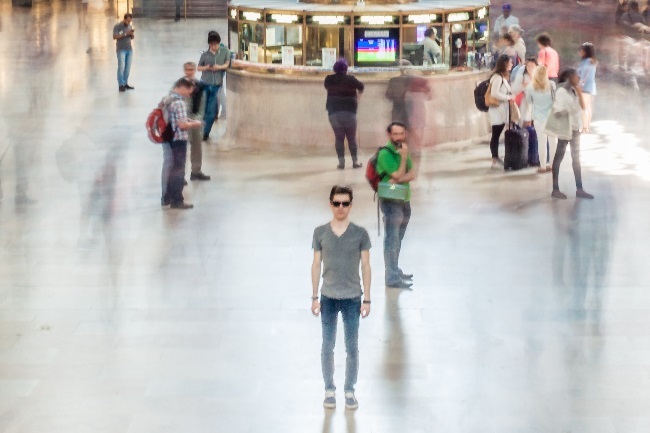 Image: Grand Central Station. Photo: Pixabay. Prediabetes usually has no symptoms, and this is the reason why 9 out of 10 people with this condition do not know they have it. The visible symptoms of prediabetes are barely detectable – most people don’t notice a thing. People discover that they have prediabetes only with a blood test. Prediabetes remains largely undetected because blood sugar testing isn’t a routine lab test. 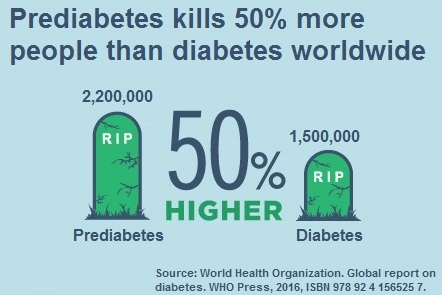 Prediabetes kills 50% more people than diabetes worldwide. Data: WHO Press, 2016. Prediabetes kills 50% more people than diabetes worldwide, according to a 2016 report from the World Health Organization. Risks of skipping prediabetes treatment. Graphics and data courtesy of CDC. Prediabetes comes with most of the same types of health risks as diabetes, such as stroke and heart disease. Without treatment, prediabetes harms one’s health. While the health risks of untreated prediabetes aren’t as severe as those of diabetes; when left untreated, the condition causes far more deaths, because the disease is largely undetected. Without treatment, prediabetes significantly increases the odds of developing full-blown type 2 diabetes, a disease that takes six years off a person’s life, doubling the risk of fatal heart attack and stroke. Here are two shocking statistics. First, between 15-30 percent of untreated prediabetics develop type 2 diabetes within five years. Second, about 40% of Americans alive today will develop type 2 diabetes. 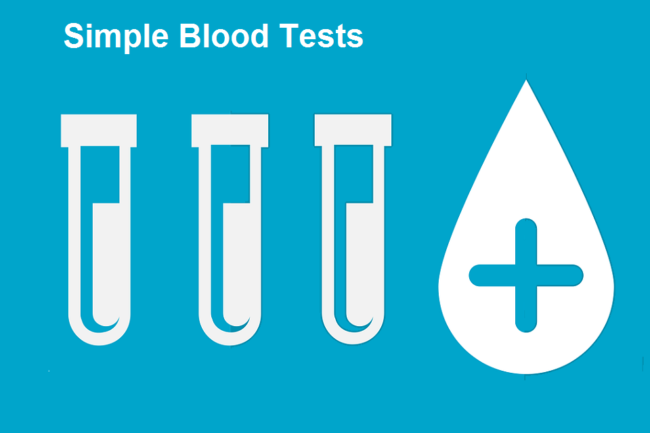 Simple blood tests screen for prediabetes. Doctors recommend screening for prediabetes beginning at age 45, but sometimes sooner if you have other risk factors, especially being overweight. Doctors use the same simple blood tests when screening for both diabetes and prediabetes. The tests most commonly used are the A1C (Glycohemoglobin) test, the Fasting Blood Sugar (FBS) test and sometimes the Oral Glucose Tolerance Test (OGTT). The tests most commonly used are the A1C (Glycohemoglobin) test, the Fasting Blood Sugar (FBS) test and sometimes the Oral Glucose Tolerance Test (OGTT). Only a physician can make the diagnosis. Because knowing your results is the first step to maintaining your health, visit your doctor and get your blood sugar tested. A simple online app can assess your risk for prediabetes. The app is jointly sponsored by the American Medical Association, the ADA, the Ad Council and the Centers for Disease Control. The app has seven questions and takes about one minute to complete. Access the online app at this link. More than one in three American adults are walking around prediabetes, and 90% of them don’t know it. Untreated, prediabetes is a risk factor for diabetes and is unhealthy on its own, killing 50% more people than diabetes. Because the condition is largely untreated, prediabetes is one of America’s leading silent killers. If you are at high-risk, it pays to visit your doctor and get tested for prediabetes. If you are diagnosed as prediabetic, please read our companion article on prediabetes treatment options. Prediabetes treatment is inexpensive and prevents the disease from stealing years of your life. One click helps us spread the word – Share this post on your social media account and help your friends. It only takes one click on any of the social media links on this page. World Health Organization. Global report on diabetes. WHO Press, 2016, ISBN 978 92 4 156525 7. Available Online. Centers for Disease Control and Prevention. About Prediabetes & Type 2 Diabetes. Online Report. Only Available Online. Yuli Huang, Xiaoyan Cai, Weiyi Mai, Meijun Li, Yunzhao Hu. Association between prediabetes and risk of cardiovascular disease and all cause mortality: systematic review and meta-analysis; BMJ 2016 (23 November 2016); 355 doi: https://doi.org/10.1136/bmj.i5953, (BMJ 2016;355:i5953). Available Online. Diagnosis, Advice, and Treatment: This article is intended for informational and educational purposes only and is not a substitute for professional medical advice. The information provided in this article should not be used during any medical emergency or for the diagnosis or treatment of any medical condition. A licensed physician should be consulted for the diagnosis and treatment of any and all medical conditions. Call 911, or the equivalent emergency hotline number, for all medical emergencies. As well, consult a licensed physician before changing your diet, supplement or exercise programs. Photos, External Links & Endorsements: This article is not intended to endorse companies, organizations or products. Links to external websites, depiction/mention of company names or brands, are intended only for illustration and do not constitute endorsements.